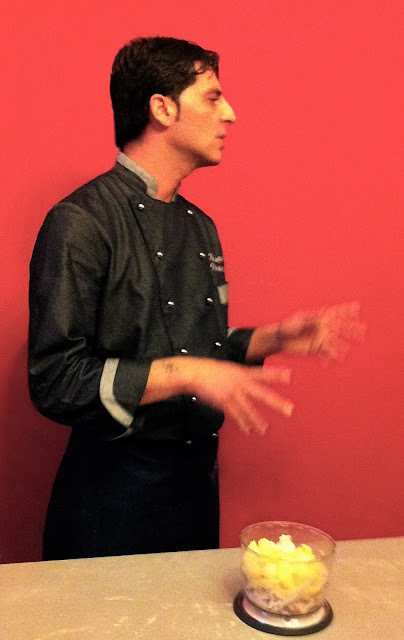 If you read my post on my cooking class with chef Mauro Improta, you already know I was very impressed. As I promised, I took part in one of his lessons again and, in a cheerful and carefree spirit, I learned how to make fresh stuffed pasta. Among the dishes prepared by the dynamic chef, here is the recipe for you to cook the Cuttlefish ink cockscombs filled with gilthead bream and potatoes and a julienne of cuttlefish and escarole. After having extracted the ink from the cuttlefish, Mauro placed it at the centre of a flour mountain, he added the eggs, salt and mixed it well to obtain a smooth dough to wrap in plastic film and to leave to rest in the refrigerator. After that he steamed the fillets of gilthead bream and he blended them along with the potatoes and grana padano cheese, adding a little salt, pepper and parsley, to make the filling. The chef julienned the cuttlefish, lightly frying them in a pan with oil, garlic and cherry tomatoes and flavouring with salt, pepper and parsley. At this point, he rolled out the dough and cut it into circles with a pasta cutter and placed an amount of the filling on the top of each one. Then Mauro closed the ravioli in a cockscomb shape, he boiled them for a couple of minutes and then he cooked them in the sauce of cuttlefish until creamy, adding the blanched escarole, cut into julienne strips, and a trickle of olive oil and a pinch of white pepper. In addition to being good, these ravioli have a truly captivating colourful effect!